For some reason marking knives have bubbled up to the surface around the web. I use two marking knives consistently,and a plain old scratch awl for most of my marking tasks. They are indispensable to my work and are almost always on my bench top. In fact to grab photos for this post, I just went through recent images to find ones with the marking knives in the background. Which marking tool I grab depends on what action I’m doing. 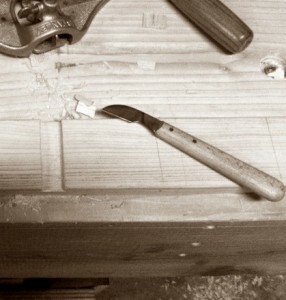 If it’s rough cross cut, called a “third class” saw cut I’ll just grab the awl and scratch away. My only concern is that I can see the line, and that it is straight, the rest I don’t care about. This is usually where I grab my big toothed cross cut saw and hit it hard and fast. I’m just breaking the stock down at this point or I know I’m going to be cleaning up the edge later on the shooting board. I picked up a handful of blue handled awls at Harbor Freight for use in the shop. 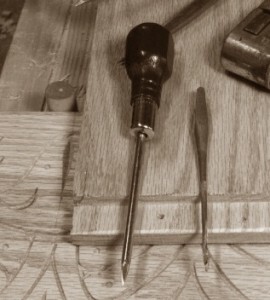 I’ve modified a couple of them into birdcage awls, and brad point awls, but I keep a couple unmodified close at hand as they are very useful. They are great for laying out carving patterns for the 17th century stuff and you can often still see traces of scratched line layouts on old chests and boxes by the old carvers. My workhorse marking knife for the longest time was this old chip carving knife I used originally for wood block carving. I use this for marking out cuts on the show faces. I lay my square on the line, and do several passes with the knife. The first pass is light and the focus is on dead nuts accuracy. Each successive pass adds more pressure making a deeper cut each time. I find with this type of knife I can really crank down on it, and get a nice deep clean cut on my third or fourth pass. I will also lay the knife into the leading and trailing edge of the cut and press down to sever the fibers a bit more where the saw enters and leaves the wood. This is a “Second Class” type cut according to Robert Wearing from the Essential Woodworker and I usually will add a “V” notch at the start of the cut to make sure my saw doesn’t jump out of the cut and ding the edge when I make my first cuts. For marking dovetails, or making really precise lines I’ve been using the Blue Spruce spear point marking knife. I got one for myself as a treat for my birthday last year and it’s a high class tool. The workmanship is top quality and it is a joy to hold in my hand. It wasn’t cheap and it is definitely a luxury. Chris Schwarz wrote about spear point knives a while back, and Popular Woodworking just re-posted the article to their blog. There is also a review of the new Lee Valley budget spear point marking knives out there too. I’m still getting comfortable with this style of knife, as I find it a little delicate for my tastes. But when it comes to marking dovetails (I’m a tails first kind of guy), this knife has no equal. For a “first class” saw cut this knife also does well, although I’ve used both the previous knife and the spear point to good effect. Start out the same way with light then increasingly deeper cuts keeping a clean edge. I then follow up with the knife angled into the waste side to create a trough or lopsided V notch for the saw to ride in. Some people use a chisel to cut this but I usually just use the knife. The creates a path for the saw to travel in as well a severing the fibers on the show side leaving a really clean edge where it matters. I have a Blue Spruce knife too, and I do like like it. I’ve been using mine just for laying out joinery cuts (I actually have both sizes, and I primarily use the large one for this). I expect the small Blue Spruce knife would work well for transferring tails too, but I starter using the Rob Cosman knife for this a I really like it. 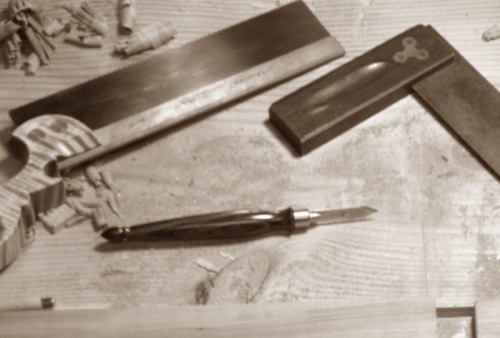 The knives I’d used before for dovetails seemed to wander and not leave a crisp cut. The Cosman knife doesn’t have this problem. I think it’s the geometry of the blade tip, it’s slightly curved along its length. It’s not an “art tool” like the others, in fact it looks like a utility knife. But it works like a champ. I plan to make another Shaker-style candle box as a Christmas gift, and maybe another dovetailed box as a gift. I’ll try to do a proper comparison. Probably in Claro Walnut, so it will be a good challenge.